Ever find yourself so wrapped up in a film that you feel as through you've become a part of the plot? Watch obsession turn into a story of its own. Do you remember what it was like when you first discovered Tarantino? Id love to say that I was the trailblazer in my group who turned everyone else onto him, but thats unfortunately not the case. What did happen was that a friend bubbling over with excitement at being the one to throw back the covers on Reservoir Dogs, dragged us down to the art cinema for an eye-opening experience akin to the first play of Rage Against The Machine’s debut album, and repeated almost as much. I kind of feel I have to get something out of the way before I can discuss this week’s pick. I realise it’s fashionable, even expected, to hate on Tarantino nowadays. That we’ve moved from the early days of discovery and cult following, through the mass acceptance of his talent as a director and back out to a certain distain for his blatant fanboy love of cinema and the stolen motifs that pepper his work; except I haven’t. I continue to get excited when I hear about a new project he’s hatched and can still remember and connect to the reasons I fell for him in the first place. Yeah, his films are arguably great, but remember the video-store-clerk-gobbling-up-films-and-writing-scripts backstory to his career? That was so good, because that meant he could be you or you him. The referential and reverential cinema of Tarantino is the place many of us mentally occupy, happy to fly our film colours high and proud so we can share me-too moments with our taste bedfellows. This is exactly how I felt watching the 15 min short Tarantinos Mind, directed by Manitou Felipe and Bernardo Dutra, the faces behind the Hungry Man-repped Brazilian duo, 300ml. 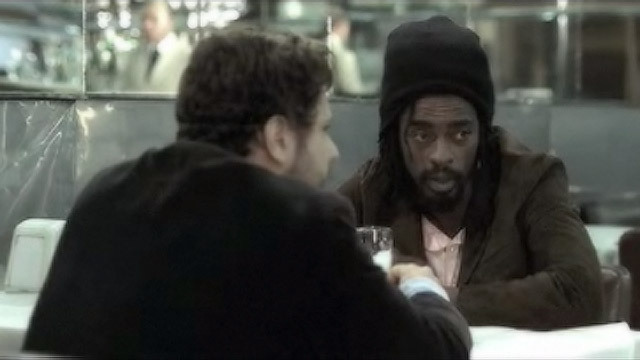 The conversation between leads Seu Jorge and Selton Mello is a version of the numerous discussions fans have had about the work of the director, although the easy flowing and sometimes tangential, dialogue feels like it could have been directly clipped from a Tarantino flick, sandwiched between the intentions of a foot massage or an analysis of Madonna lyrics. Their conversation unfolds in an unspecified dinner where the two sit more or less alone aside from the peppering of poker players, intellectuals and philosophers. As Mello espouses his theories of the Tarantino code we get illustrative flashes, either directly lifted from the films in question or seemingly culled from those worlds. The films opening is also one of the most sublime I’ve seen, with script typed fragments of Tarantinos inspirations bonded to wood that forms the short’s title – in oriental script of course. From the many reactions to the film it’s obvious that 300ml got the fervor of the Tarantino obsessed fan bang on, as the short itself mainly escapes criticism. Rather, it’s the accuracy, logic or timeliness of the revealed Tarantino Code that’s held up for scrutiny, which is pretty much what happens between the characters on screen. Tarantino’s Mind has got me thinking it’s time for a back-to-back marathon run through his films, but this time with my conspiracy notepad close in hand.